This Tico style house has a two story separate new air conditioned apartment in the back that has a distant ocean view and is located in a quiet neighborhood only 2 miles away from the famous Manuel Antonio National Park and Quepos. 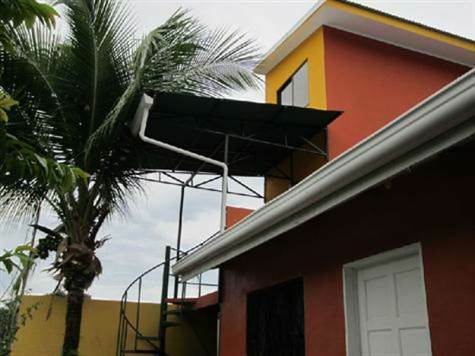 This home is ideal for a full time resident, retiree or someone looking to enjoy a home in Costa Rica. The home could also serve as an income producing long term rental. The location is very central and close to all the amenities you might need. With two grocery stores a short stroll away, bus stop at the end of the street and friendly neighbors. Recently updated, the home has high ceilings, ceiling fans, sliding aluminum windows, enclosed patio, laundry area and secure storage, new appliances, tile floors and gated parking for two cars are just some of the good things this house has to offer.